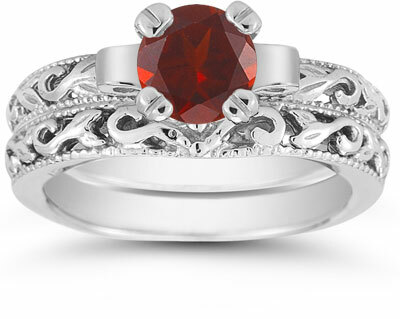 Crimson color and art deco style define this sumptuous bridal ring set from Apples of Gold. The single garnet stone measures 6mm for a truly stunning display of elegant color. The gemstone is round cut for added depth and shimmer, and it rests in a setting of 14K white gold. 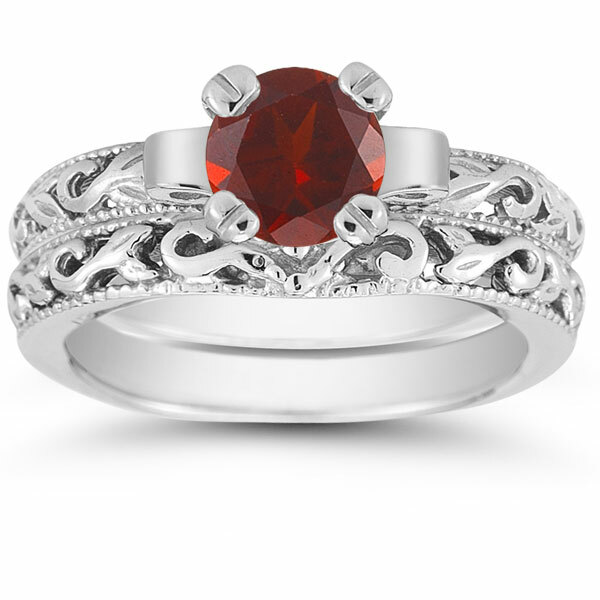 Each band is also crafted of premium white gold, and they reveal an art deco styling to complement the garnet stone. The superior craftsmanship and style of this ring set are perfect for any bride. We guarantee our 1 Carat Garnet Art Deco Bridal Ring Set, 14K White Gold to be high quality, authentic jewelry, as described above.